Selma was officially chartered as a Town on February 11, 1873, but the Town’s true birth took place on May 1, 1867, when there was a public sale of lots around a newly established station on the North Carolina Railroad. Selma was born as a “Railroad Town,” and our rail heritage is still evident today. The Town is home to the Mitchener Station, which was built in 1855 and thought to be the oldest surviving train station in North Carolina. The Town of Selma is home to three distinct historical districts: The Downtown Selma Historical District, the Richard B. Harrison School District, and the West Selma Historical District. The Downtown Selma Historic District is located in the historic commercial area of the town of Selma in Johnston County, North Carolina. Selma is situated in North Carolina's Coastal Plain approximately thirty-two miles southeast of Raleigh. The Johnston County seat of Smithfield is less than two miles to the southwest. Beginning in the late nineteenth century, Selma has been located at the junction of several major transportation corridors. The town was established on the North Carolina Railroad in 1867 and incorporated in 1873. Selma grew significantly after 1886, when a branch of the Wilmington and Weldon Railroad intersected with the North Carolina Railroad making Selma an important rail junction in eastern North Carolina. In addition to rail transportation routes, several major highways pass through or near Selma. Interstate 95, the major north-south corridor on the East Coast, lies just east of Selma and was completed from Fayetteville to Kenly, which is just north of Selma, in 1961. U.S. 301, which begins in Delaware and ends in Sarasota, Florida and parallels Interstate 95 throughout most of the Carolinas and Virginia, runs north-south through Selma and assumes the name Pollock Street within the town limits. U.S. 70, an east-west highway that runs from the community of Atlantic in Carteret County, North Carolina, to Globe, Arizona, passes just to the southwest of Selma. For More information on the Downtown Selma Historical District, please click the link for the National Archives of the National Register of Historic Places. Click Here. Richard B. Harrison School occupies three parcels—on West Noble Street and on South Brevard Street— on the west side of the town of Selma in Johnston County, North Carolina. The school sits on 6.84 acres in a historically African American residential area. The site contains an agricultural building constructed in 1953 with a 1965 bricklaying shop addition; a gymnasium and classroom building built in 1955; and the 1956 elementary school classroom building. A baseball field from ca. 1950 and a mid-twentieth-century concrete block pump house also occupy the parcels. The gymnasium and classroom building is used for community basketball games and to house a Head Start preschool, while the elementary school building remains unoccupied. The Richard B. Harrison Alumni Association owns the agricultural building and bricklaying shop and uses it as its headquarters and meeting space. The site occupied by Harrison School served as the hub for African American public education from the late nineteenth century into the 1980s. Three additional buildings devoted to education once stood on the parcels. In 1880, a two-room school, which is no longer extant, was built at the south side of the parcel. Later, an early twentieth-century frame school that had served white students was moved to the site and functioned until it burned on February 4, 1933. It was replaced by a three-story, brick building constructed in 1935 with New Deal funding. In 1948, that building received a ten-room addition. The 1935 school and its addition were demolished in 1995. 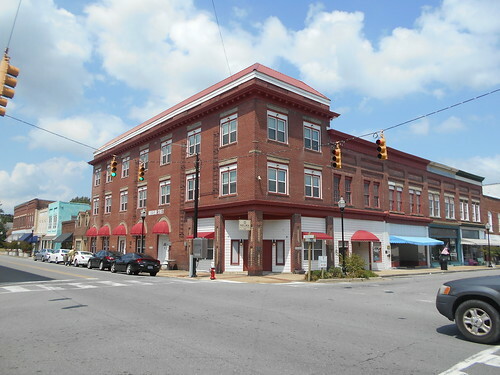 For More information on the Downtown Selma Historical District, please click the link for the National Register of Historic Places. Click Here. The West Selma Historic District encompasses approximately ninety acres of a primarily residential area west of downtown Selma in Johnston County. Selma is situated in North Carolina's Coastal Plain about thirty-two miles southeast of Raleigh, the state capitol. The Johnston County seat of Smithfield is less than two miles to the southwest. Beginning in the late nineteenth century, Selma has been located at the junction of several major transportation corridors. The town was established on the North Carolina Railroad in 1867 and incorporated in 1873. Selma grew significantly after 1886, when a branch of the Wilmington and Weldon Railroad intersected with the North Carolina Railroad making Selma an important rail junction in eastern North Carolina. In addition to rail transportation routes, several major highways pass through or near Selma. Interstate 95, the major north-south corridor on the East Coast, lies just east of Selma and was completed from Fayetteville to Kenly, which is just north of Selma, in 1961. U.S. 301, which begins in Delaware and ends in Sarasota, Florida, and parallels Interstate 95 throughout most of the Carolinas and Virginia, runs north-south through Selma and assumes the name Pollock Street within the town limits. U.S. 70, an east-west highway that runs from the community of Atlantic in Carteret County, North Carolina, to Globe, Arizona, passes just to the southwest of Selma. For More information on the Downtown Selma Historical District, please click the link for the National Archives of the National Register of Historic Places. Click Here.